SwissDock, a web service to predict the molecular interactions that may occur between a target protein and a small molecule. S3DB, a database of manually curated target and ligand structures, inspired by the Ligand-Protein Database. Would you like to organize a workshop? Please let us know so that we can adjust the computing resources accordingly. 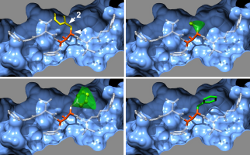 many binding modes are generated either in a box (local docking) or in the vicinity of all target cavities (blind docking). simultaneously, their CHARMM energies are estimated on a grid. the binding modes with the most favorable energies are evaluated with FACTS, and clustered. the most favorable clusters can be visualized online and downloaded on your computer. SwissDock and S3DB are developed by Aurélien Grosdidier, Vincent Zoete and Olivier Michielin, from the Molecular Modeling Group of the Swiss Institute of Bioinformatics in Lausanne, Switzerland. Inspect the source code of this page to see how easy it is ! SwissDock, a protein-small molecule docking web service based on EADock DSS. Fast docking using the CHARMM force field with EADock DSS.